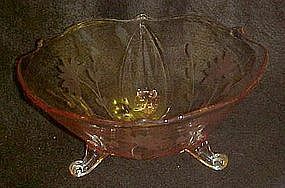 A beautiful pink depression glass bowl sits on three curly-Q legs and is in the petal line by Lancaster glass. It has a floral etching similar to their Jubilee pattern. Measures 8 1/2" in diameter and is 3 5/8" tall. Amazing condition, with no chips, cracks or cloudiness. This is a pretty shade of the pink depression glass, and would make a lovely addition to yur collection.